I’m a Director of Business Development at Afilias, offering registry services and secondary DNS to the domain name industry. Prior to this I was the Vice President of Channel Development at 101Domain.com. I’ve been involved in the domain name business now for over 17 years and am still very excited about the industry. I’ve recently joined the Executive Board of the Domain Name Association. I became interested in the Internet and domain names while working as a National Accounts Manager at AT&T Wireless and have made it my full time profession since 1999. At that time, there were several “worlds” that existed in the domain name industry and they were very much separate. There were registries and registrars. These were the people who managed policy and sold domain names to the public. They were mostly interested in the business end of things and policy issues at ICANN. They attended ICANN meetings and at that time, I don’t think most of them had any idea of how valuable domain names really were. Then there were “domainers” (That’s how I started.). Domainers viewed domain names as Internet real estate and bought them and sold them and tried to make money with them. The domain parking business grew from this niche and this niche was also quite valuable to the growth of Google and Yahoo. It’s still important to them today and still represents a reasonable share of how they make money today. Finally, there were the hosting guys. These people were generally very technical in nature; many of them were system administrators who understood how to manage and secure hosting. A lot of these have become very large businesses so they must have known a good bit about business as well. Today, all of these disciplines have converged. Registrars are often domainers. Domainers are often registrars. And many of them offer email and hosting as well or do it themselves. Most importantly, it’s exciting to be in an industry where there is still considerable growth and opportunity around the world. What do I Write About Here? I follow a lot of topics in the news and try to share new ideas as I find them. Sometimes I like to write about the taboo subjects of religion and politics but I try to keep it subtle. Many of my friends have opposing views. I love living in Chino Hills in Southern California. I’ve been married for 38 years to a wonderful gal who I love very much. I have two grown sons (two amazing daughter-in-laws) and six grand-daughters. I am conservative in politics and Christian in my faith. I enjoy studying and sharing information about the Internet, marketing, sales, and human nature. I’m fortunate to see my work as a passion and I enjoy it more than any game. I also enjoy political discussion, high level business strategy, the blues, Jimi Hendrix, & Stevie Ray Vaughn. I have a few hobbies, collecting classic sales books and tapes, photography, skiing when I can, chess, genealogy, working out, and playing a little guitar. I read like crazy; probably too much if one can read too much. I’m kind of proud of two websites that I put up in the earlier days of the Internet. They weren’t Yahoo or Google but they both mean a lot to me. The Internet Archive and the Wayback Machine are invaluable resources and provide an archive of websites and television programs for many years back. These are things that could easily be lost forever if no one does what they do. I am so happy that I can look back to websites and projects I’ve worked on from many years ago. I wholly support the Internet Archive and hope you will consider a donation to them as well. My family and some friends that I know have been touched by Lyme Disease. It’s no fun and there are still a lot of people affected by this awful disease that don’t even know it exists. It mimics other health problems. If you care, ask me about it some time. I hope you will consider supporting the Global Lyme Alliance. They are doing some good work. Although I’ve never been in the service, I’ve always admired my father, who served in the Army during WWII. Lucky for me and my family, he came home OK; but many don’t. We should always support our wounded veterans. Love Mali is a ministry from our church that educates and ministers to over 600 children in Mali. It’s good work and definitely needs support. If you want to help you can get contribution information by writing to the church and ask how. Alagna.com is my business blog. I eventually plan to develop a private family web site here as well. I’m really proud to be an Alagna. Our family came to America in the early 1900s from the region of Marsala, Sicily and settled in New York and Chicago. I often hear from distant relatives and love making distant family connections. Both my mom’s and dad’s families lived near a small town called Strasatti. Other nearby cities and regions are: Petrosino, Magghiu, Tortorelle, Bonafede, Campobello di Mazara, and Mazara del Vallo. My dad’s family made wine (unfortunately I never learned the art). My mom’s family had a ceramics business that is still in operation today although different than when my grandfather ran it. They also still own several businesses in the town of Strasatti, including a clothing store. Disclaimer: Opinions offered here are my own and may or may not be the same of the company I work for or of the registrars we work with. 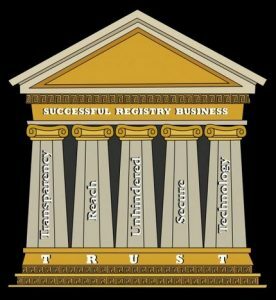 I work for a registry and work with several registrars. I’m also a private domain name investor and although not very active, I do buy and sell domains from time to time. I’m General Manager, North American Markets at CentralNic LTD., a domain name registry. I work with some great people there and have enjoyed being part of this fantastic industry for over 10 years now.I became interested in the Internet and domain names while I worked as a National Account Manager at AT&T Wireless and have made it my full time profession since 1999. At that time, there were several “worlds” that existed in the industry and they were all separate. Then there were “domainers” (I was one of them). Domainers viewed domain names as Internet real estate and bought them and sold them and tried to make money with them. The domain parking business grew from this niche and this niche was also quite valuable to the growth of Google and Yahoo. It’s still important to them today and still represents a reasonable share of how they make money today. Finally, there were the hosting guys. These people were generally very technical in nature; many of them were system administrators who understood how to manage and secure hosting. A lot of these have become very large businesses. Today, all of these disciplines have converged. Registrars are often domainers. Domainers are often registrars. And many of them offer email and hosting as well or do it themselves. It’s just exciting to be in an industry where there is still considerable growth and opportunity around the world. I love living in Chino Hills in Southern California. I’ve been married for 32 years to a wonderful gal who I love very much. I am conservative in politics and a Christian in faith. I enjoy studying and sharing information about the Internet, marketing, and human nature. I’m fortunate to see my work as a passion and I enjoy it more than any game. I also enjoy political discussion and high level business strategy. hope this note finds you well. Great website, congratulations! Keep posting. If you ever want to visit Alagna, Valsesia and to do some great off-piste skiing, please let us know… it would be a pleasure to introduce an Alagna to Alagna! Skiing in Alagna, Italy is one of the things I hope to do before I check out of this world. Thanks for the note. 1. My nephew Rafal Laguna is CEO of http://www.Open-Xchange.com. It is a cloud based mail program that currently has about 50 million users and growing exponentially. It is a great add-on sale for hosting companies and registrars to sell to their customers. Since you have good connections in those fields and are GM of Central Nic North America, it may be of mutual interest to promote and make an extra income from selling the OX Email service. Open-Xchange.com is not a good domain name and I suggested that they should try to get OpenExchange.com in addition and I offered that I would get that domain for them. It was not easy, but I succeeded. 2. I read that you have an interest in political discussion and I have written a number of websites on economics, one of which promises to end the recession and propel the economy to new hights of prosperity in ecord time. But unfortunately it is as hard to believe for people as is my 4 minute per day exercise machine. At age 71 now, I just about have enough energy to dream up these things and put them on websites, but I lack the time and energy to promote them. I wonder whether you might have some ideas to get specially http://www.EndingRecession.com into going viral? Lets all promote http://www.EndingRecession.com and have a real prosperous and truly happy new year. I’m quite busy with CentralNic but your nephew’s product looks like a great product. I think you were right to help him acquire that name. I’ve read through EndingRecession.com and it’s very interesting. I must say that our politicians sometimes can’t see the simplest of solutions. Wishing you the best of the holiday season and a happy new year.